It’s been rumored heavily as of late that a Star Wars Land will be coming to both parks. Mice Chat is saying that it could replace Toon Town in Disneyland. So, a 3-part question. Would you be excited for a Star Wars Land? Would you be okay with it replacing Toon Town? What would you most like it to replace in both resorts? Kelsee – I can’t say I would be excited. However, I know there are many people who will be, so it is a smart move on Disney’s part. I would rather have them theme a new land with Marvel than Star Wars but that’s just my opinion. As far as replacing Toon Town with the proposed Star Wars land, I find it quite disheartening. I understand they are trying to make profit and reach a diverse group of people, but Toontown is a great place for families. If they had to replace Toontown, I’d at least hope they would keep Minnie and Mickey’s house. I would much rather have a new Fantasyland expansion in Disneyland as they did in Disney World if they really wanted to remove Toontown. In my opinion, I think they should replace Bug’s land in California Adventure than put Star Wars Land where Toon Town is. It fits much better in California Adventure (theme wise) since a large part of California’s culture is the movie business and Hollywood. As far as where to put it in Disney World, I’d also like to see Star Wars land stay out of the Magic Kingdom. Either Epcot or Hollywood Studios would be a great place since both parks need a breath of fresh air. I really don’t believe having Star Wars land would ever be in Walt’s plan if he was still alive, especially in the Magic Kingdom or Disneyland. It would be a great expansion for other parks and I understand the concept, but I don’t want the original idea of Disney to be tainted (for lack of a better term) to something that was never a part of Walt’s vision, and I don’t think ever would’ve been. Melissa Hoyt – This blew my mind because I had heard rumors of Marvel and Angry Birds expansions, but nothing about a Star Wars Land until now. As far as excitement goes, I think a Star Wars Land could be really cool. In fact, with Disney World, I think Star Wars has enough diverse planets, characters, etc. that they could make a whole Star Wars Park with different lands based off of the franchise. I could see this being a really neat and popular idea. As for replacing Toon Town with it, I have mixed emotions. I rarely visit that area of Disneyland anymore, but I remember it being extremely magical as a child. I have a really, really, REALLY difficult time justifying tearing down Mickey and Minnie’s houses. Destroying the “living place” of the character who started it all seems really wrong to me. That could be just because I hate change, or perhaps because I love Mickey Mouse so much, but it just doesn’t feel right to me. I think overall I think of Walt Disney and what would have been his vision for the parks. Most, if not all, of what started these resorts was a Walt Disney original creation. I also know that he state himself that the parks would be an ever-growing and changing place. However, I don’t think he would enjoy the idea of “selling out” and creating new lands just based on the popularity of other franchises that Disney now owns. It just doesn’t seem to capture the true heart and spirit of Disney to me. I also think about the fact that both Disneyland and Disney World already have Star Tours located within the park and wondering what moving that attraction (as I am sure they inevitably would) would do to the flow and feel of the lands that they are currently in. I would much prefer something more Disney related, like another Fantasyland expansion or a land dedicated more to Pixar, something like that. Again, I think with all the property they have at Disney World they could just create a completely separate Star Wars park. I will be interested to see what they end up deciding and what the general public as well as Disneyphiles like us think. Leslie – With my newfound love of Star Tours I would love a StarWars land I think it would be awesome and bring a bigger part of a large culture to Disney instead of Universal (which has much for my nerd culture). It though may not be the best move to do in Disney World right now as they are working on their Avatar themed area so I would like to see how each area would do on their own before trying to put them in both American resorts. Let’s get down to the big no on the table. Do not replace my childhood Disney. I love Toon Town, I love it so much that I would probably cry if they replaced it, even if they replaced it with StarWars land. I love Toon Town, and it is one of the best places in the park especially for children and for character interaction. Personally it feels much more interactive to visit Mickey’s house in Disneyland than any of the character interactions I went to in Disney World. I also worry that by removing Toon Town they are working to phase out the old image of Mickey and Friends and are trying to phase in their new….”versions” of our beloved characters. It also seems really weird to put StarWars land anywhere but next to Tomorrowland. Especially given the fact Star Tours would need to be moved into StarWars land since it would be weird the two being in the same park but not together…seems kind of awkward to me. I agree with Kelsee, replace Bug’s land in California Adventure, a much better fit and less giant bugs to me to have nightmares over. As for if they were to put it in Disney World I definitely think it should go somewhere by Star Tours in Hollywood Studios, especially since there is the giant AT-AT Walker (which is so amazing) I think it should be tied in there somehow because the detail would be amazing once it came together. The problem in this lies in space. There would need to be so much deconstruction if this was to happen as there is no room to add-on with the freeway and entrance so close. With the Backlot Tour closed though it sounds like they have plenty of room to incorporate it there. Melissa Long – For me, I think a Star Wars land would be epic! I used to watch the originals on VHS all the time and I think it would be a great addition even if it wasn’t ‘originally’ Disney. As far as Toon Town, I’d be fine to see it go as long as they either moved Mickey and Minnie’s house or kept those. To be honest that is the only part of that land that I remember and would be a little sad to see go. However, I hardly ever go to Toon Town anymore and in fact forget that it is there, but if a Star Wars land went in there, I would definitely not forget about that part of the park. I also can’t think of any other place in Disneyland to put it unless you moved to California adventures as mentioned by most of you. But I enjoy the Bugs Life land so if say take over that part by the flying swings, that’s a part of that park I never seem to remember about. And if it goes in Disney World, I would say add it to Hollywood studios or add another park. Andrew – First of all, I’d love a Star Wars Land. Assuming that the land would be of the highest quality, I think the attractions that would be a part of it would be absolutely incredible. There are pretty limitless options as far as creating attractions. It’s a whole universe, so if it came to both coasts they could be different (say one Star Wars Land could be Tatooine and the other could be The Death Star, I’m just making stuff up). That way they wouldn’t just be replicating things and both parks are a destination. This whole making lands after franchises (Cars Land, Avatar (Pandora) Land, Harry Potter World) is the fad right now in theme parks and while it might not last it’s pretty incredible. This may get me in some trouble, but I don’t like the movie Cars yet I absolutely love the Land. I don’t care a bit about Harry Potter but Diagon Alley is a blast. I really don’t like Avatar but I’m pretty dang excited to see some floating mountains. So, seeing a franchise I love being turned into an immersive environment is extremely exciting to me. Now, I’ll become the real bad guy. I’d be excited about Star Wars Land replacing Toon Town. There’s not really an attraction I love there. Roger Rabbit is the only one I’d miss but it’s not irreplaceable by any means. I’ll tread lightly here because so my fellow bloggers don’t get too upset. Mickey and Minnie’s House doesn’t mean a whole lot to me. To me, Disneyland is Mickey’s house. Mickey and Walt made that park and as long as that ‘Partners Statue’ is standing in front of the castle, that won’t be forgotten. Disneyland is very kid friendly even without Toon Town. I’m not the biggest fan of A Bug’s Land either but I don’t think there is enough space if you simply take out that land and try to replace it. There’s no room for expansion there either as they won’t be taking out Cars Land or Tower of Terror anytime soon. That’s why I think Star Wars Land fits best in Toon Town in Disneyland. As far as Disney World, I would do as Leslie suggested and put it surrounding where Star Tours currently is. There’s a nice Lucas connection too with the Indiana Jones Theater (assuming that makes it through the Studios overhaul). It could take up from the Streets of America to where Star Tours is now with a Pixar expansion coming to where the old Backlot Tour was. Go Star Wars! Please leave your answer to the question in the comments! We’d love to hear from you. A recap of the week, links, and a look ahead after the jump. This week on the blog was kicked of by Melissa L giving us a few tips about how to experience Cars Land. Andrew reviewed lunch at Be Our Guest Restaurant and continued his trip report from May 2014. Melissa Hoyt had a really fun post about the top-10 rides to experience at night. Last but not least, Kelsee wrote about the Animation Building in California Adventure. On the right side of this post, you can like our Facebook page and subscribe by email to the blog. This way you’ll receive notifications whenever there is a new post up. The Disney Food Blog took a look around at what’s new in Disney World. The Disney Tourist Blog had a post about Trader Sam’s Enchanted Tiki Bar (in Disneyland) during Christmas time. 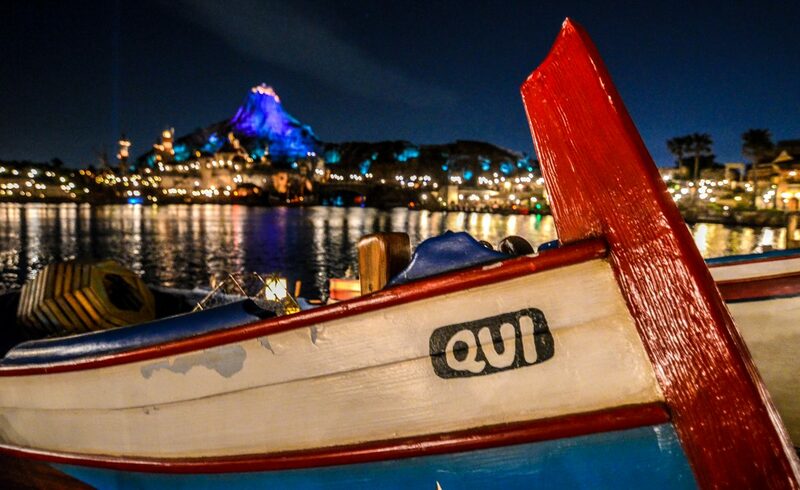 The Disney Parks Blog had some great pictures in their Disney Parks Photos post. Plus, a few other posts!